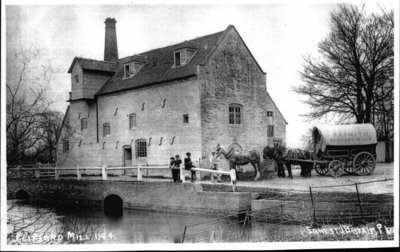 The Mill, which was, and is, and always would be – or so I thought in 1968. I was coming back from my first walk exploring the river bank, and before me stretched the Mill meadow with its diagonal path cutting through the tall grasses and daisies, ornamented here and there with flaming poppies. Beyond the meadow, the warm red-bricked Mill beckoned me inside. Up the timbered stairs, I found the cogs and wheels of the Mill machinery. Although these were silent and still, the wisps of straw, dried husks of corn, and general dust that had settled on the timbered floor and on the machinery, spoke to me of another time. This was where Jack Sylvester from No. 14 checked the mill stones, running his fingers through the crushed corn to define its texture; where he kept the cogs oiled, and hauled sacks of flour to the hoist. In the room above, he tipped the corn husks down the chutes to the mill stones below. In 1968, I stood and looked at this room in dismay. The light coming through the cobwebbed window high in the wall, showed a floor thick and slippery with chicken dung. Feathers were everywhere. The attic beyond was a different story. The wooden beams here were so crystallized, so rock-hard, any axe would have difficulty getting through them. The view across the Mill pond which lead into the River Stour, was beautiful from the granary door. Here Jack fastened his flour sacks onto the hoist, swinging them out, then lowering them onto the wagon below. Bill King, (who lodged at No. 23), with his red, sweating face, was in charge of the wagon, always leading the first horse as he took the sacks of flour to the bakeries in the area. He was assisted by young Jack Radbourne (christened John Lee Radbourne). Later in life, young Jack was always referred to as ‘old Jack Radbourne’ to distinguish him from an even younger Jack Radbourne! The wagon was led by four horses. These horses were beautifully groomed by Bill King, and carried gleaming harnesses decorated with polished brasses – which probably explained why Bill King always had a red, sweating face! Jack Radbourne, as wagoner, was responsible for just the wagon and its load. Every morning, Mr. Greenway from the other Mill (now flats) sent a young lad to the Manor Mill with a message for Jack Sylvester. The message always had the same words. “Mr. Greenway says, would Mr. Sylvester put the sluice gates on to the ……notch please.” The Manor moat, which controlled the machinery at the Manor Mill, was considerably higher than the river on which the other Mill relied, so the positioning of the sluice gates was essential to the good running of the further Mill. Jack Sylvester was responsible only for the Manor Mill and its orderly working. The mill wheels constantly needed checking especially after heavy rain. The large wheel, visible to those passing by, controlled the cogs and turnstiles leading to the mill stones. The other, hidden under the ground-floor timbers, operated the hoist which was fixed above the granary door. Never did Jack Sylvester allow the Mill to flood! At the least sign of any heavy rain storm (and Jack could read cloud and bird formations as well as anyone, to predict the oncoming weather), he would scurry along the bank of the Manor moat to the sluice gates and latch them up. With all the moat water pouring into the River Stour, there was little chance of the small stream left running under the Mill, swelling so much that the Mill could be flooded. When Jack considered that their fear was so terrible they would never dare go there again, he unlocked the door and made the girls walk out one by one, under his terrible and awesome look. Sure enough, Bobby Windsor, the local policeman arrived at the school next morning summoned by Miss Wilding, the village school teacher. “He was a big man,” Kath told me, “with a big belly, and we were all terrified of him.” They were told they were Never to go in The Mill Again, and if they did there would be Great Trouble! Both Mills were owned by a Mr. Sidney Smith who apparently owned other properties in the village. Occasionally he would call to inspect both Mills in his sports car, the make of which, my father-in-law told me, no longer exists! It would never start without help, though he always chugged into the village with no trouble. Once his spluttering engine was heard, all the boys would race down to the Mill, ready – once inspection of the Mill had been carried out – to push the car up the Mill slope and onto the main village street until the engine spluttered into life. When Mrs. Douty purchased the Mill, she arranged for the river beds to be thoroughly dredged. The one wheel was taken out and replaced by a turbine with batteries to provide electricity for the Manor and Manor cottages. Later, she provided electricity for the Church and Rectory, but a generator was needed then in addition to the turbine, to provide the 110 volts for the four buildings. The Mill continued to make flour with just one wheel, but not in the vast quantity as before. Eventually Mrs. Rees-Mogg (as she was then) turned the Mill into a laundry for use by the Manor, a Mr. and Mrs. Holstead from No. 15 being in charge of it. Soon after I arrived, the Mill was sold to a young family, and the massive shaft leading to the hub of the ancient wheel was sawn in half, so the young children of the family would not kill themselves by trying to start the wheel. After that, there was a succession of families living there, one turning it into an antique centre, another into a trout farm, but the old mellow brick is still the same, though the diagonal footpath across an English meadow has gone. This page was last modified on 15 September 2011, at 23:29.